1. Thank God for peanut butter! I was able to take spoonfuls for a little hit of protein and healthy fat and deliciousness of course. 2. Whole Foods, I thank you. I went here a few times for some spicy salmon rolls (they have pretty good sushi) and the lovely salad bar. They can be somewhat pricey; however, I was able to concoct a few awesome salads (kale, mixed greens, quinoa, corn, peppers, squash, chicken, craisins, etc.) and also buy Poland Springs seltzer water (my favorite!) for around $6, which was pretty reasonable. 3. 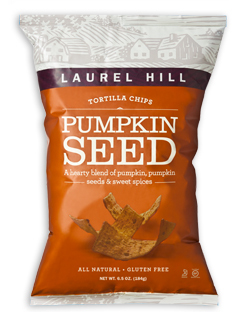 New discovery: Laurel Hill PUMPKIN SEED TORTILLA CHIPS!!!! Now we’ve been over this before, but I have a very strong love for all things pumpkin. To stumble upon these in Whole Foods was an absolute treat. The flavor was absolutely awesome and they actually incorporated pumpkin seeds into the chip. Now granted I would not classify chips as “healthy”, but the addition of pumpkin seeds (they contain some good fat) helped these chips redeem themselves. 5. Oatmeal was my choice breakfast seeing as we were able to heat up water on top on our fireplace. I sampled some instant blueberry as well as apple cinnamon oatmeal with added flaxseed. 6. Finally, apples were my essential/convenient snack of the week. It was a challenge, but we survived and I have never been more thankful to be able to use my kitchen appliances.